The inscription on the bust of Ataturk, outside the Bodrum military complex regards he was born in 1881, but his death date is regarded in stone thus ‘…’ Kemal Pasha lives on. His face, on banners and flags, looks off into the distance in an infinite, eternal multiplicity wherever we look. It is 15 years and once again we are in Turkey on Republic Day, 29 October. Then and now the timing was accidental, coincidental in fact with UK half-term holidays. There are plenty differences in the Republic today but also ghosts, the most dominant of which is that of the founder himself, or perhaps what it is he is perceived to stand for. 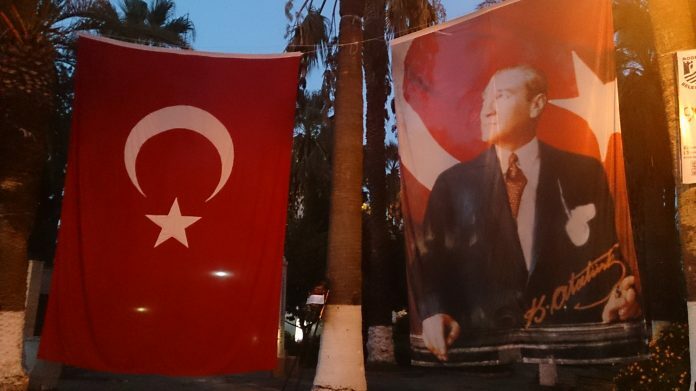 We caught some of the Republic Day celebrations in Bodrum. A muted procession started the evening, followed half an hour later by a larger parade of motorcyclists, all flying the flag. A young mother castigated her son, perhaps 4 or 5 years old, for carrying the flag incorrectly. It was harsh, as were the stares at our bescarved group waiting for spouses and siblings to return from the mosque after Maghrib prayer. As the temperature dipped, the stares and the comments from those coming to join festivities added to the chill in the air. Nothing direct, just behind your back, our foreignness not just ethnic but religious too. As brothers and sisters returned from the mosque, itself besieged by a bar pushed up next to its late Ottoman ablution facility, we decided to walk through Bodrum’s town centre, filled to the brim with everything a foreign tourist could want to pay for. Between said mosque and another dating back almost 300 years were bars and tourist tat. It was seaside resortish, though overpriced, but it may as well have been Istanbul 1998, except then and now people ‘like us’ could hide in the Fatih district of the metropole and be insulated from the hatred and the sale of Turkey as a tourist experience, devoid of the culture that everything from the tourist fez to the tulip embossed cushions and ceramics sold to the Western consumer, originates. The story says (maybe said), that all is happy happy now in Turkey and everyone loves each other. Gone was the hatred, disappeared just as the deep state disintegrated after the Ergekenon trials finally defeated the deep state that had hitherto kept the country virulently – violently – secular, military, suffocating. Then came Gezi Park and the nationwide protests and then all sides began to instrumentalise the stand-off as evidence of latent hate. Those not involved, internally and externally, could just take sides in what was in reality more complex. Those hatreds, distrust and dislikes do exist, but not in the ways interested parties in the Gezi showdown tried to imply. They simmer beneath the surface. The comments and stares in Bodrum are just the trickle down of decades of anti-Islam discourse, in law, politics and media, so entrenched it sees the present government mooting hate speech laws in an attempt to break the cycles of vilification. Whilst restricting speech is always a grey area, the real test for these measures is how far they will also protect Kurds, Alevis, Shias and all the other ‘others’ still marginalised as the neo-Ottoman project finds realisation in the rise of Recep Tayyip Erdogan and his clique but not in the realisation of a neo-Ottoman pluralism. The term itself, decried when first proffered by some not so sympathetic US think tank has now been adopted, the charge led by Foreign Minister Ahmet Davutoğlu. Journalist and former political prisoner Nureddin Şirin has much to say about the repetition and recycling of structures of hatred. He and so many like him, bought into the idea of a new Turkey. Impatient now, they joined the throngs at Gezi Park, in no way nationalists of the old order, but deeply dissatisfied at the polarising rhetoric. Şirin states that the current government instrumentalises anti-Alevite feeling within its borders and with out, has reneged on its promises to the Kurds, and pushes an anti-Shia sectarian discourse and policy in its foreign affairs. This was not the way Turkey was supposed to change. Some signs that the discourse has finally changed –- some good news for a change from the battlefield of Turkish politics – do show. Another former prisoner, another journalist, joins us for our programme in Bodrum. Once a refugee in the UK when they still let a few in, he can return now. His imprisonment was for an article berating the ban on hijab at universities and in public life. More language change is forthcoming on this topic. Though repeals of the bans have been long in coming, even under a supposedly Islamist government, most are now actually gone or at least widely flouted. Judges, prosecutors and the military are still barred from donning the veil but it’s not just the law that is changing. The response of the Republican People’s Party CHP party to the arrival in parliament on Thursday 31 October of 4 female deputies in hijab, was new and brave and refreshing. Sevde Beyazıt Kaçar, Gülay Samancı, Nurcan Dalbudak and Gönül Bekin Şahkulubey, freshly returned from Hajj, decided to adopt the dress code, they were joined a day later by Canan Candemir. CHP was the once powerful oft-ruling nationalist party that in 1999 led the clamour (literally stamping feet, slow clapping, shouting and booing) in the Meclis to have the then Virtue (Fazilat) Party deputy Merve Kavakci thrown out. Its leader Bulent Ecevit, leading the pack, declared, “Put this woman in her place!” Not only ejected from parliament, Kavakci was stripped of her citizenship and her case used in the Constitutional Court to ban the predecessor of AKP, the Fazilat Party. In 2014, the ghost of Kavakci’s expulsion was laid to rest by the leader of CHP himself, Kemal Kılıçdaroğlu, who in effect chastised his own irate party members in advance by stating there would be and should be no issues with Mesdames Samancı, Dalbudak,Şahkulubey and Candemir’s choice of attire. Of course, watching late night news programme on 31 October, it was clear that many, including many media outlets themselves, were still very unhappy and those precluded by the CHP whip from speaking in the Meclis, spoke outside of it and vented their spleen well. But now, post-Ergekenon, they are becoming, if not quite yet, pariahs. The flags still festoon the street lamps and buildings in Istanbul when we arrive, much like 15 years ago. Though he is still there, the images of Ataturk are much less, so it seems. Maybe it is a false memory, wishful thinking, on my part. As he fades from memory, it feels as though there is room to breathe – a little – and new ideas, and some old ones too, can come to the fore. Though all is not well in Turkey, all is not lost. The trick is not to replace one arrogance with another. That one needs testing on 29 October another year. See you in Istanbul, 2023?